Is Haribo the most prolific candy maker ever? Maybe they don’t have the same amount of goods in the US as they make available abroad, but darnit if it doesn’t seem like every time I turn around, Jonny is handing me yet another bag of Haribo I haven’t tried, let alone heard of. 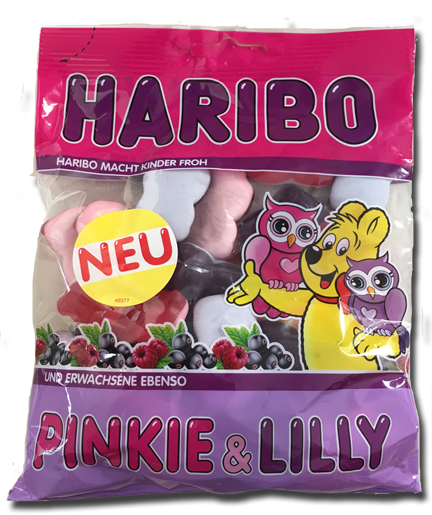 This time it’s Haribo Pinkie and Lillie – two little owls on the package that I assumed was some type of cartoon sponsorship. When I opened the bag, it was like an old friend. The same sweet aromas only Haribo can create but this time way fruity and berry-ish. They looked just like Haribo frogs, minus the exact shape of course – owls do not equal frogs – but they were roughly the same size and the same half mallow half gummy. Same chew as the frogs too. And again, really only Haribo can make gummies like this. Haribo out of the gate (or rather, out of the bag) have a decent chew to them. Aging in a fridge or just throwing in a cupboard with the bag open, will always help — don’t think I’m suggesting you don’t age your goods; that’s heresy — but Haribo doesn’t mandate it, like other gummies. So if you like the haribo frogs and always thought, “man, if they would just make this with a berry flavor,” then you’re in luck. And if you ever said, “man, if there was just some candy that had owls for their mascots,” well then, time to go buy a lottery ticket. Note, however, my non European friends, these may not be available to you unless you high tail it around the internet and pay in some strange currency. Link below. 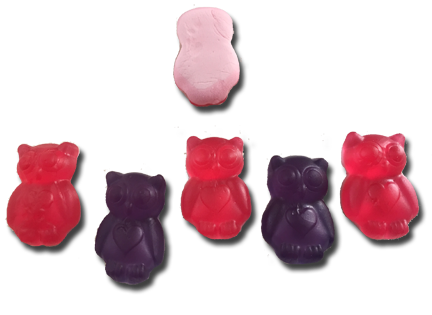 It seems that those two owls are just Haribo´s interpretation of the “trend” that is owls in general (and by now no longer a trend, by the way, but never mind). I have double checked the Haribo website as well as the rest of the internet, but there is no such thing as a cartoon series featuring Pinkie and Lilly. I am glad you like the owls – I was expecting Jonny to give them only a one star rating as he does not like the foamy consistency, hehe.. 🙂 Great he handed them over to you! Wait a second….owls are trendy in Germany??? What the hell is going on over there? As always, thanks for being our patron saint!